BOSTON, MA, FEBRUARY 14, 2019 – Vertical Systems Group announces that six companies achieved a position on the 2018 U.S. Carrier Ethernet LEADERBOARD as follows (in rank order based on year-end 2018 retail port share): CenturyLink, AT&T, Verizon, Spectrum Enterprise, Comcast and Windstream. 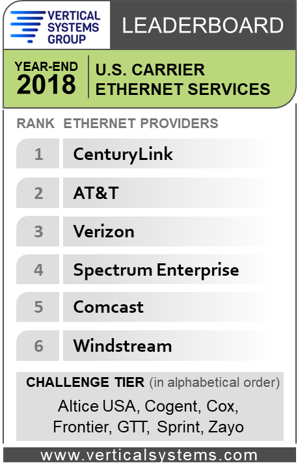 To qualify for a rank on this LEADERBOARD, network providers must have four percent (4%) or more of the U.S. Ethernet services market. Shares are measured based on the number of billable retail customer ports in service as tracked by Vertical Systems Group. U.S. retail Ethernet customer installations grew to more than 1.1 million ports, up 12 percent from year-end 2017. Six Ethernet providers qualify for the 2018 LEADERBOARD, as compared to seven in 2017 and nine in 2016. Cox dropped out of the LEADERBOARD and into the Challenge Tier on slower than market port growth. Four Incumbent Carriers (CenturyLink, AT&T, Verizon, Windstream) and two Cable MSOs (Spectrum Enterprise, Comcast) are represented on the latest LEADERBOARD. The two Cable MSOs (Spectrum Enterprise and Comcast) had the highest port growth in the second half of 2018. Ethernet pricing declined in 2018 across all port speeds for the six service types tracked by Vertical (i.e., EPL, EVPL, DIA, Access to VPN, Switched Metro and VPLS). Each of the 2018 U.S. LEADERBOARD companies has received MEF CE 2.0 certification. In addition to the LEADERBOARD providers, all other companies selling Ethernet services in the U.S. are segmented into two tiers as measured by port share. The Challenge Tier includes providers with between 1% and 4% share of the U.S. retail Ethernet market. For year-end 2018, the following seven companies attained a position in the Challenge Tier (in alphabetical order): Altice USA, Cogent, Cox, Frontier, GTT, Sprint and Zayo. The Market Player tier includes all providers with port share below 1%. Companies in the Market Player tier include the following providers (in alphabetical order): Alaska Communications, American Telesis, Atlantic Broadband, BT Global Services, Cincinnati Bell, Consolidated Communications, Crown Castle Fiber, DQE Communications, Expedient, FiberLight, FirstLight, Fusion, Global Cloud Xchange, Great Plains Communications, Logix Fiber Networks, LS Networks, Masergy, MetTel, Midco, NTT America, Orange Business, RCN Business, Segra, Tata, TDS Telecom, Telefonica, Telstra, TPx, Unite Private Networks, US Signal, WOW!Business and other companies selling retail Ethernet services in the U.S. market. Detailed Ethernet share results that power the Year-End 2018 Carrier Ethernet LEADERBOARD are available now exclusively through Vertical Systems Group’s ENS Research Program subscribers of @Ethernet. Contact us for subscription information and pricing.